As Kenya continues to execute and roll-out its ambitious goal of devolution, a lot of expectations have been raised among the public with regards to efficiency and effectiveness of public services delivery. The devolution seeks to address multiple objectives: tackle long-term, deeply entrenched disparities between regions; increase the responsiveness and accountability of government to citizens; allow greater autonomy to different regions and groups, and re-balance power away from a historically strong central government (KSG, 2015). As such the county Governments have assumed major responsibilities, and funding, for delivering functions such as planning, health, agriculture, urban services, and local infrastructure among others. Of these functions, public participation in planning is considered to be a critical part of devolution. The 2010 constitution of Kenya, which is the main legal framework, places a strong emphasis on strengthening public participation. Coupled with governance, public participation is considered to be a core element in Kenya’s strategy to accelerate growth and address long-standing inequalities in economic opportunities, investment, and service delivery in different parts of the country. Multiple studies have documented links between persistent poverty/inequality and governance weaknesses that reduce the efficiency and equity of public investments and services, impede the investment climate, and undermine job creation (KSG, 2015). In this spirit therefore, local communities within the devolved units have now a greater opportunity to participate in shaping their destiny by taking part in critical activities such as planning for the county’s development agenda in both the short and long term. In this spirit, Lamu county government has taken advantage of this policy direction by ensuring that local communities are part and parcel of the planning process. This scenario recently manifested itself during the development of the Lamu county Integrated Development Plan (CIDP) for the period 2018 – 2022. Ordinarily the CIDP is the most important planning document that guides the development agenda as well as the resource allocation in the county for the next five years. It forms the basis for disbursement of Equalization Funds to the County from the Exchequer and also serves as reference point in the annual budgeting process. It contains specific programmes and projects, a costed implementation plan, provisions for monitoring and evaluation and clear reporting mechanisms. It also has information on investments, projects, development initiatives, maps, statistics, and a resource mobilization framework. This journey has been with lots of consultation through public participation forums with CBOs, National Government agencies, NGO’s, religious leaders and other key stakeholders. Through the forums, the community was given ample freedom to come up with issues that requires urgent attention coming five years in their respective wards. As such, quite a big number of community members from all the 10 Wards were actively engaged in the process of crystallizing programmes and projects that address priority needs of the Lamu residents.. As such the Lamu CIDP has incorporated the needs, aspirations and dreams of the Lamu residents in their quest to improve their general quality of life.Together with the public views, Governor’s manifesto, SDGs, vision 2030 and the Big Four Agenda were also critical planning documents that were used to guide the CIDP development process to ensure alignment with the National Government overall development agenda. 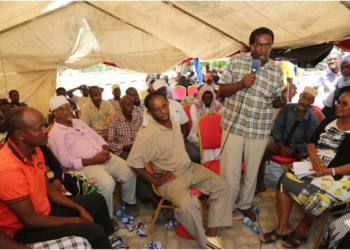 It is evident therefore that the Lamu county residents are now to a certain extent enjoying the fruits of devolution in as far participation in the planning process is concerned. This is a great opportunity that was previously not available prior to devolution. Through a rigorous and engaging process the residents of Lamu, technical experts from the various departments, local leaders under the overall guidance of the Executive were together able to prepare the CIDP. The CIDP was eventually submitted for review and approval by the Lamu County Assembly. As the planning phase closes, we can only hope and pray that the execution of the CIDP will significantly contribute to the achievements of the overall Lamu County Government goal of improving the quality of life for the Lamu residents.